Add temperature control to the RA2 system for increased convenience and energy savings. Control temperature from keypads or mobile devices. The three-part system design puts each component where it makes sense. can be mounted anywhere even on an exterior wall. allows the temperature to be measured in the optimum location. 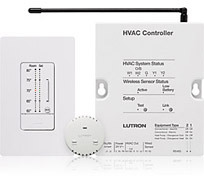 C) The HVAC controller part# LR-HVAC-1-WH installs out-of-sight. 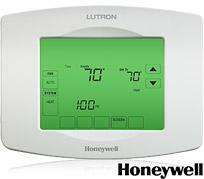 The surface mount Lutron TouchPRO RA 2 Wireless thermostat controller combines the trusted brand of Honeywell® with that of Lutron innovation. This newest addition to RadioRA 2 is a simple way to add temperature control to the Lutron RadioRA 2 system.